Hooria Liaqat did her M.A. 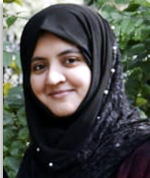 in English Literature from the University of the Punjab in 2014 with distinction of earning the Roll of Honor and subsequently the University Gold Medal. She completed her M.Phil from the University of the Punjab in 2016. Her M.Phil dissertation was titled“(Re) Location of Power in J.M. Coetzee’s Disgrace and Foe”. In 2017, her connection with the Department of English Language and Literature transformed and she started working here as a Lecturer. Prior to her induction at the University of the Punjab, she was working as a lecturer at the Punjab Higher Education Department. She has participated in national and international conferences. Her academic interests include Postcolonial literature, Modern fiction, Elizabethan and Modern Drama.